A magnitude 6.4 earthquake occurred on Tuesday, July 28 at 6:35 pm AKDT (July 29, 2:35 UTC) in the Cook Inlet region of Alaska (red star on the map). It occurred at a depth of 117 km (73 miles) and was located 55 km (34 miles) ENE of Pedro Bay, 75 km (47 miles) WNW of Anchor Point and 95 km (59 miles) WNW of Homer. The Alaska Earthquake Center reported about 10 aftershocks in first 12 hours after the mainshock. 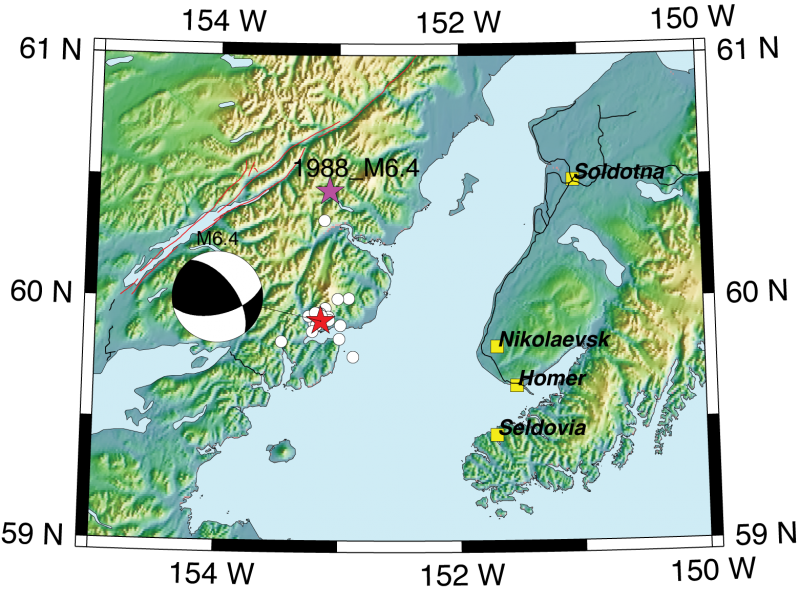 The largest aftershock was recorded at magnitude 2.9. It is common for deeper events to produce very few aftershocks. This earthquake was felt widely in Southcentral Alaska and the Kenai Peninsula. Maximum shaking of intensity VI (strong) was reported in Clam Gulch. No major structural damage has been reported, however some residents reported cracks in walls and items falling off shelves. This earthquake occurred in the downgoing portion of the subducting Pacific Plate. The Aleutian trench marks the boundary between the subducting Pacific and overriding North American plates in southern Alaska and the Aleutian islands. While the largest earthquakes occur on the interface between these two plates (like the 1964 magnitude 9.2 earthquake), the downgoing portion of the Pacific Plate produces earthquakes down to 200 km (150 miles) in southern and central Alaska. The faulting type of this earthquake is consistent with down dip extension of the Pacific Plate as it is pulled into the mantle under its own weight. This is the largest intermediate-depth earthquake in this region since February 7, 1988 M6.4 earthquake (pink star). The elastic-wave radiation pattern of the M6.4 event indicates reverse faulting consistent with down dip extension of the Pacific Plate as it is being pulled into the mantle under its own weight.